Charles J. Weston, contractor, procured a building permit for this home on April 1, 1899 and began construction. 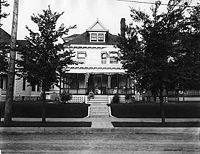 By 1900 Henry Hahn was listed in the city directory at this address and appeared on the 1900 federal census with his wife, Lillie, son, Louis, and a servant, Bonnie Peterson. Hahn worked in the printing trade. In 1900 he was a foreman at the Northwest Miller, a newspaper of the milling trade. He and a partner incorporated their printing and binding firm, Hahn & Harmon, in 1904. In the later years of his career, Hahn was back at the Northwestern Miller. He lived in this home until his death in 1935. Lillie lived here until she died in 1943. This page was last modified on July 12, 2008, at 04:36.